Montréal, April 19, 2017 – L. Jacques Ménard, President of the Board of Montréal International, and Hubert Bolduc, President and CEO of Montréal International, today announced the agency’s 2016 results. Our remarkable achievements include bringing in 35% more foreign direct investment (FDI) than in 2015 and expanding the region’s talent pool and community of international organizations. With Europe and the United States shifting toward protectionism, the global political and economic landscape holds many challenges for Greater Montréal, but there are also opportunities to be seized in terms of attracting foreign investment, international organizations and skilled foreign workers. In 2016, Montréal International helped 39 foreign companies locate or expand in the region, facilitating a record 1.35 billion in foreign direct investment, up 35% from the previous year. The investments accounted for 15% of GDP growth in Québec and generated $115 million in tax revenue for the province, in addition to helping create or maintain 3,240 direct jobs in Greater Montréal. Foreign direct investment dollars flowed mainly into the following sectors: information and communication technology (52%), including big data, artificial intelligence, visual effects and animation; aerospace (15.1%), agrifood (10.7%), and life sciences and health technologies (6.8%). Investment by U.S. firms accounted for close to half of all investments, more than double compared to 2015, as a result of increased lead generation efforts in that market. Greater Montréal has recently been named one of America’s top 5 destinations for foreign direct investment and placed among the top 3 for FDI strategy in fDi Magazine’s American Cities of the Future 2017-2018 rankings. In 2016, we stepped up our efforts to bring more skilled workers and international students to Greater Montréal and foster growth in the region’s high-tech sectors. For example, we provided strategic support, helping 289 skilled international workers with their temporary resident applications, and hosted information sessions, giving 231 workers an insight into the permanent residency application process. What’s more, we organized overseas recruitment drives and helped 35 local businesses hire 164 qualified and experienced workers. We also worked with Québec’s Ministère de l’Immigration, de la Diversité et de l’Inclusion to launch I choose Montréal, an extensive information campaign designed to encourage the city’s 32,000 international students to stay in Montréal after completing their degrees. In 2016, we brought the Centre for Innovation and Knowledge Transfer on the Social and Solidarity Economy (C.I.T.I.E.S.) to Montréal, consolidating the city’s position as a pioneer of the social economy. We also facilitated the expansion of the Finance Alliance for Sustainable Trade (FAST), a leader in farm and forestry financing for developing countries. What’s more, we supported 40 Montréal-based international organizations in their development efforts. The year was also a particularly successful one in terms of the number of international organization projects submitted to financial partners. Montréal ranks third in North America for number of organizations, behind New York City and Washington, D.C., and our goal is to provide all governmental and non-governmental international organizations in the city with the strategic support they need. International organizations shine a global spotlight on Greater Montréal and foster economic growth in the region, providing 1,500 high-quality jobs and generating $300 million in spin-offs per year. In November 2016, Montréal International organized the first Greater Montréal Attractiveness Forum, a major event where over 500 business community representatives worked together to find ways to make the region more competitive and more attractive to businesses. Forum participants made 25 recommendations on a number of issues, including attracting and retaining temporary skilled workers, promoting university education and leveraging new technologies. 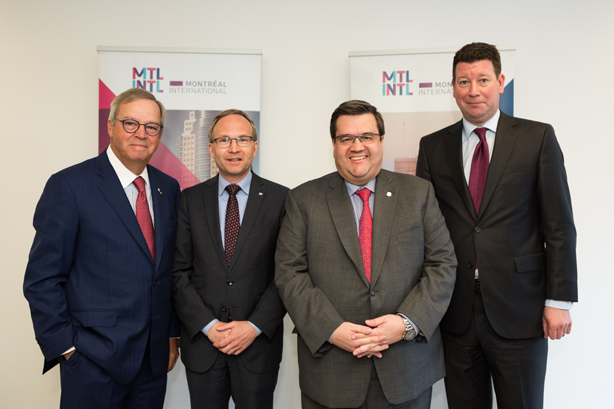 From left to right: Mr L. Jacques Ménard, President of the Board of Directors, Montréal International, Mr Martin Coiteux, Minister of Municipal Affairs and Land Occupancy, Minister of Public Security and Minister responsible for the Montréal region, Mr Denis Coderre, Mayor of Montréal and President of the Communauté métropolitaine de Montréal, Mr Hubert Bolduc, President and CEO, Montréal International.